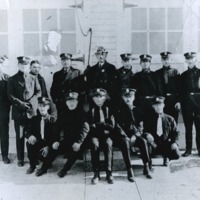 Group portrait of members of the Meadow Brook Fire Department. Group portrait of members of the Meadow Brook Fire Department. The department was located in Uniondale (then known as East Hempstead).